Not every house has a room that can be set aside for work alone, but the beauty of the home office is that it can be integrated into almost any room. The trick is making the dual purposes play nicely with each other without (come on, it just has to be said) their dueling. Here are some tips to make the best of one room with two motives. 1. Spare bedroom. A spare bedroom and office combo is one of the most common setups. It makes a lot of sense. Unless you're constantly playing host to out-of-towners, an uninhabited bedroom can be a great workspace. 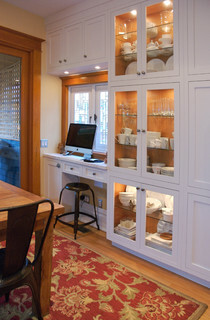 Built-in cabinetry will make the most of your room. Keep a few drawers empty for guests; dedicate the rest to files and supplies. Desks with pullout features provide more space when needed and keep delicate equipment safe when visitors wielding oversize luggage come over. To squeeze every inch out of your bedroom office, use a sleeper sofa. Here a built-in bookcase frames an elegant sofa that can accommodate business meetings during the day and guests overnight. 2. Living room. When integrating an office into the living room, make sure the space has a welcoming, sophisticated air, just as you'd expect from any other well-designed living room. 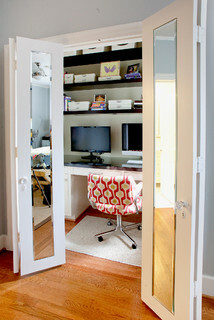 That way guests won't feel like they're encroaching on your private workspace — or worse, sitting in an untidy office. In this room the emphasis is on warm, community-oriented features: the fireplace, bookshelves and a variety of seating options. The desk, while spacious and functional, recedes into the background and complements, not competes with, the atmosphere. 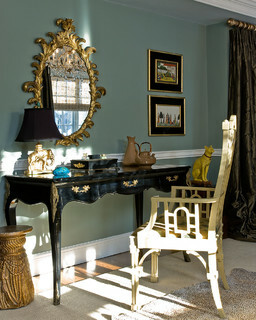 A desk that matches the living room's level of formality is a clever way to hide an office in plain sight.Here an antique desk is matched with an antique chair and mirror. 3. Closet. If you can afford the space, a walk-in closet can make for a highly effective work environment, thanks to its quiet nature. When the doors are shut, you could go unnoticed by the rest of your household for days. One obstacle that could stand in the way of a closet office is a lack of adequate light, as closets generally don't have windows. Adding a light tube (if the closet is on the top level of the house) or getting creative with lighting fixtures can solve this issue. 4. Family room. An office in the family room has pluses and minuses. On the one hand, working near the kids offers family integration. Parents get to hang out with their children; the kids don't get resentful that Mom or Dad is always too busy for them. On the other hand, noisy distractions and important deadlines don't mix well. 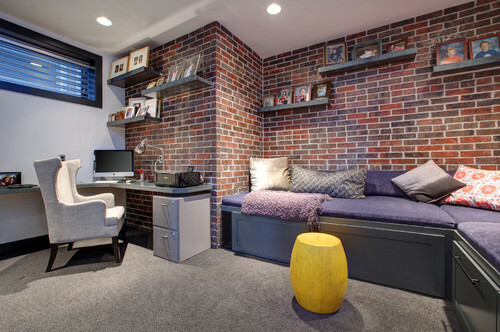 If you can work out a schedule that suits everybody's needs, the office–family room combo can be a huge success — especially in a room like this, where built-in benches hide toys and provide a cozy environment both during the workday and after hours. 5. Kitchen. Every family kitchen should be equipped with a mini office. At least it might feel that way to a parent getting bombarded with requests for signed permission slips and help with homework in the middle of fixing dinner. Itcan be as simple as a drawer organizing system that holds everything from a stash of writing utensils and paper clips to the checkbook for those "I forgot I'm supposed to bring money" moments. 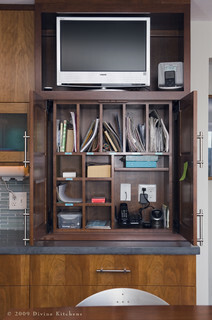 If you can afford more space, a sweet setup like this one keeps household affairs in check and gets closed off behind cabinet doors when not in use. 6. Dining room.No, this isn't about using the dining table as a desk, though honestly its size isunbeatable for large projects. Here a desk is built into a hutch, and a low-profile stool gets tucks out of the way under the counter. When the owners host a dinner party, they can even move the stool and computer and use the desktop as a serving area. 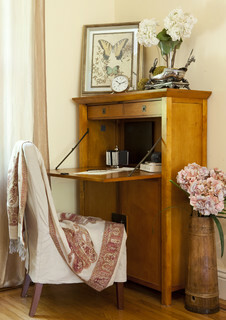 If a built-in hutch isn't a possibility, an antique secretary desk is a great alternative. Its streamlined silhouette and fold-away tabletop allow it to be disguised as furniture appropriate to a room's primary function.